Veneers are custom, porcelain facings that are bonded to the front surfaces of teeth to whiten teeth, close spaces, straighten teeth, or repair chipped or worn teeth. 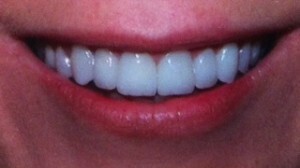 The veneers are only about 1 mm thick (the thickness of a fingernail). That same thickness is “shaved” off the natural tooth surface so when the veneer is bonded to the tooth, the tooth doesn’t feel or look “thicker”. 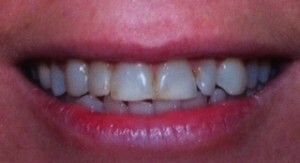 Before: Discolouration on front teeth and teeth are uneven in length.